Why are Dalits protesting against hangings in Hyderabad? Why is the focus on Muslims in JNU? Why are the students insisting on representation from marginalised communities when they are being judged by a committee? The fact is that India reserves the death penalty mostly for Dalits and Muslims, says Aakar Patel. Meaning given the background of the atrocities against him and his communities, Ambedkar was entitled to be harsh with his words. I thought of that as another college protest has attracted the ruling party's anger. 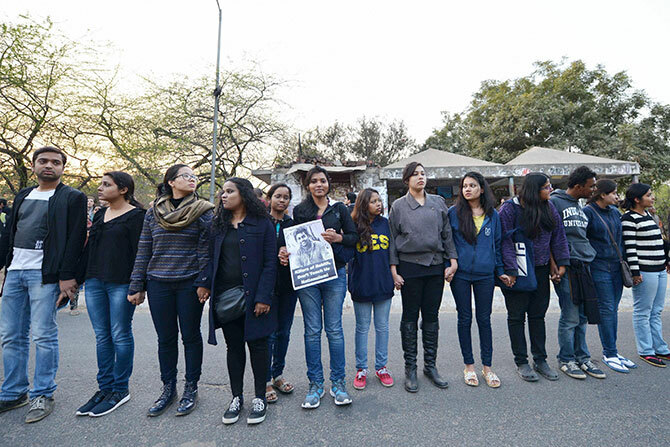 In Delhi, the police have registered charges of sedition against students in Jawaharlal Nehru University over an event protesting against the hanging of Afzal Guru. This is a repeat of the sequence in Hyderabad where the BJP acted strongly against students protesting the hanging of another man, Yakub Memon. That episode ended with the tragedy of one of the students hanging himself. JNU, which says it had not approved the event, has set up a committee to inquire, but again, the same problem of representation has arisen. The students' union says there is no member on it from marginalised communities. There was a choice here for the BJP. Instead of throwing the book at the students, it could have shown some understanding of the issue, which is linked to caste directly. Why are the students insisting on representation from marginalised communities when they are being judged by a committee? The fact is that India reserves the death penalty mostly for Dalits and Muslims. A study that will be published later this year by the National Law University shows that 75 per cent of all death sentences and 93.5 per cent of all death sentences for terrorism were given to Dalits and Muslims. The obvious issue here is that of prejudice. The government shows no signs of acting strongly when upper caste Hindus do terrorism, as the case of bombings in Malegon shows. And there is no hurry to hang the killer of Beant Singh, while Rajiv Gandhi's killers have had their death sentences commuted. They had also been convicted of terrorism, but not all of us are judged by the same rules. Let us leave aside others like Mayaben Kodnani, convicted of murdering 95 Gujaratis and not even in jail. The second issue is that of economics. Dalit and Muslim are also synonyms for 'poor'. Afzal Guru got almost no legal representation in the trial court stage. Given the reality, it should not surprise us that Dalits and Muslims and their supporters are protesting against the government. They have every right to and are justifiably upset. They are seen as out of control and unbalanced, but they are arguing on fact. It is the BJP MPs who keep shooting off letters to Smriti Irani demanding firm action against them who are acting on emotion. We in the upper castes insist that all Indians must buy into our fantasies that we are a perfect society that everyone must bow to. Hindutva's constituency is middle class and upper caste. It detests the idea of reservations because it senses its privileges are being encroached upon. This is why the Rashtriya Swayamsevak Sangh also does not like reservations and their statements on this have got the BJP into trouble during elections. The prime minister's response to this has been to accuse the Opposition of invention and lies. But the facts are absolutely clear on the ground. Dalits are getting a voice and are standing up for their rights. There is nothing wrong with that and if they use intemperate language they should not be treated as criminals. It is important the government engage them, and listen to their argument, not only their slogans. Compare the wisdom of Gandhi we saw at the beginning to the knee-jerk actions of the leaders of Hindutva, first against the students in Hyderabad and now in Delhi. We must show some mature understanding of the issues. As long as the government does not even attempt to do that, we should not be surprised that those whom we are oppressing so cruelly and relentlessly will say, write and do things that encourage people to disobey the government.